The U.S. Hunter Jumper Association is pleased to welcome EMO Insurance as the multi-year title sponsor of the USHJA 3'3" Jumping Seat Medal. The EMO Insurance/USHJA 3’3” Jumping Seat Medal Series and Finals provides Junior competitors with a competitive Jumping Seat equitation opportunity at the 3’3” fence height, culminating with East and West coast finals. "We are delighted to welcome EMO Insurance as the title sponsor of the EMO Insurance/USHJA 3'3" Jumping Seat Medal," said Kevin Price, executive director of the USHJA. "The series and finals for this program have grown in popularity since they started just a few years ago, and we look forward to another great year of competition for equitation riders nationwide." In 2019, EMO Insurance/USHJA Jumping Seat Medal classes will include two phases: an over fences and a flat for three to 12 riders. Riders who earn 10 or more points in any EMO Insurance/USHJA Jumping Seat Medal classes between August 2 and August 1 of the current competition year are eligible to compete in the USHJA 3'3" Jumping Seat Medal Finals. Finals will be hosted on both the East and West coasts, and qualified riders may choose either location. These 3’3” equitation finals aim to help riders gain experience in a format similar to that of the Platinum Performance/USEF Show Jumping Talent Search Program. ​Professional hunter competition at the 25th anniversary Capital Challenge Horse Show concluded on Friday, October 5, with the highlight $10,000 World Championship Hunter Rider (WCHR) Professional Finals, sponsored by Radwanski Enterprises. The top six professional hunter riders in the country went head-to-head at the Prince George’s Equestrian Center, with Liza Boyd of Camden, SC, ultimately emerging victorious for the second year in a row following three phases of competition. In a format new for 2018, the first round of the $50,000 WCHR Professional Challenge, held on Wednesday, October 3, also counted as the first round of the $10,000 WCHR Professional Finals, with the top six riders in the national WCHR professional standings bringing forward their scores from Wednesday night into Friday’s class. While John French was in the top six, he opted not to compete, opening up a spot for Boyd in the top six. Earning the Adult Amateur Hunter Championship at the show, which continues through Sunday, October 7, at the Prince George’s County Equestrian Center in Upper Marlboro, MD, was Garland Alban of Luthersville, MD, on Remix. For Maxwell, winning the Grand Amateur-Owner 3’3” Hunter Championship with Belgravia was déjà vu, as she and the 10-year-old warmblood gelding claimed the same honor in 2017. “It’s such an honor to win here,” said Maxwell. “I love this horse show; I was excited to be back with [Belgravia] again, and to do this twice in a row is really incredible. I’m really proud of him. ​The Capital Challenge Horse Show named two new equitation championship winners on Sunday, September 30, to conclude the show’s Equitation Weekend, presented by BigEq.com, at the Prince George’s Equestrian Center in Upper Marlboro, MD. The 25th anniversary edition of the horse show continues with hunter, jumper, and equitation competition through Sunday, October 7. Sunday’s victors were Grady Lyman of San Diego, CA, who won the Palm Beach International Academy (PBIA) North American Junior Equitation Championships, and Avery Glynn of Petaluma, CA, who topped the Taylor Harris Insurance Services (THIS) National Children’s Medal Finals. From a field of 138 entries, Lyman was one of the top 20 to return to the ring for a second jumping round in the North American Junior Equitation Championships. When she returned, she executed the highest scoring round of the weekend – earning a 96 from one of the three panels of judges and an average score for the round of 94.66. 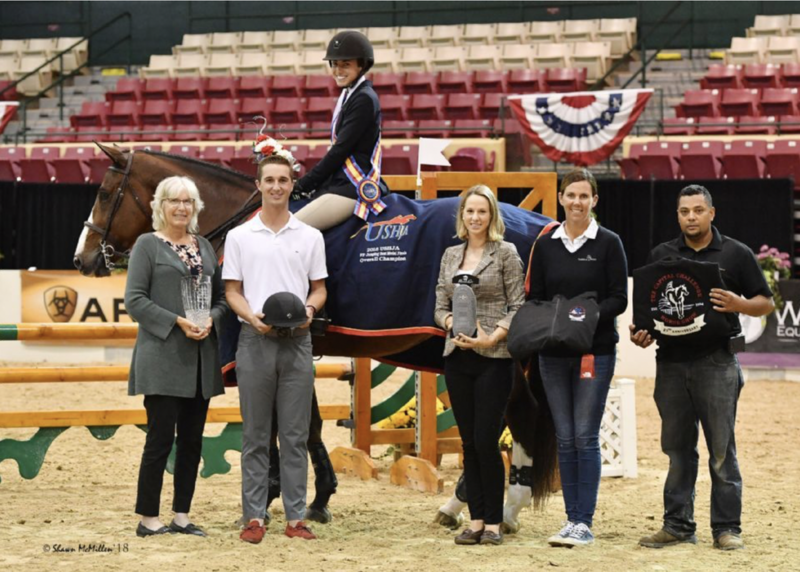 ​Upper Marlboro, Maryland – Eleven new champions were crowned on Saturday, September 29, at the 25th anniversary Capital Challenge Horse Show, at Prince George’s Equestrian Center in Upper Marlboro, MD. Among the winners on the second day of the BigEq.com Equitation Weekend was Jessica Stone of West Bloomfield, MI, who clinched victory in the second annual United States Hunter Jumper Association (USHJA) 3’3” Jumping Seat Medal Final – East. In order to secure the win, Stone had to top 121 entries over three phases of competition, including flat and gymnastics phases held on Friday and a final, jumping phase held on Saturday. Coming into Saturday, Stone sat in third on a score of 216.80, while Breanna Bunevacz of Calabasas, CA, held the lead with a score of 220.12. However, Stone soon shot to the top of the leaderboard after earning a score of 89 from judges Mark Jungherr and Sissy Wickes. That score, multiplied by a coefficient of two and combined with her score from Friday, gave Stone a 394.80 total that would prove to be untouchable by the final two riders to return. Bunevacz, 15, finished the round with a score of 84.50 in the jumping phase for a 389.12 total. ​The 25th anniversary edition of the Capital Challenge Horse Show began on Friday, September 28, at the Prince George’s Equestrian Center in Upper Marlboro, MD, with the start of Equitation Weekend, presented by BigEq.com, and the naming of the show’s first three 2018 champions. Adam Edgar of Leesburg, VA, riding Magnolia, and Lily Walton of Shelbyville, KY, aboard Callahan, claimed championships in the Adult Amateur Equitation Section A and Section B, respectively, and the North American Adult Amateur Equitation Championship title was awarded to Martha Ingram of Nashville, TN. Ingram, 21, of Nashville, TN, made the trip from Furman University in South Carolina to Capital Challenge, just long enough to top the 26 total entries in the championship class.